May is all about MOM!!!! Being a mother myself of two teenagers, I’ve been wanting to do something fun and nice for a very deserving mom. Well, once I started thinking ( I do that a lot! ), I thought about how nice would it be to be able to bless “Two” moms! I’m excited to announce my 2014 “Mom’s Night Out” Giveaway!!! Are you excited?? So, have you seen the previews for the new movie coming out on Friday – “Mom’s Night Out”? What a perfect way for two moms to be able to go see it on ME!! And that’s not all – you will get either lunch or dinner for the two of you and you will both receive individual photo sessions with your kids with me!!!! Is this a good giveaway or what??? I wish I could enter LOL….. Please make sure you read through all the Rules and Guidelines. It’s pretty simple, but will be lots of fun when we start seeing all the pictures posted!!! You must be a MOM! There are NO age restrictions. You can have a newborn or have a 30 year old. All Moms of any age are welcome to enter. Any personal information provided to Wendy Walker Photography will only be used to contact the two winning moms. No solicitations will occur. No contact information will be shared with any other persons or entity. By entering the contest your are granting permission for Wendy Walker Photography to edit, reproduce, and publish mobile photographs submitted to the 2014 Mom’s Night Out Giveaway. Photographs will be used but not limited to promotion of the giveaway through publishing on Wendy Walker Photography’s website, blog, or through social media affiliated with Wendy Walker Photography. By submitting a mobile photo for the giveaway, you forgo any rights to approve editing, reproduction, and publication by Wendy Walker Photography. The photo session for each mom and her children includes up to (1) hour session, (1) 5×7 print, (1) 8×10 print and a Facebook Timeline Cover. Each winning mom receives (1) ticket to the movie “Mom’s Night Out”. The location will either be at Lake Square Mall in Leesburg or at Rialto in The Villages. Lunch or dinner will be provided to both of the winning moms. The name of the restaurant will be announced throughout the contest promotion. 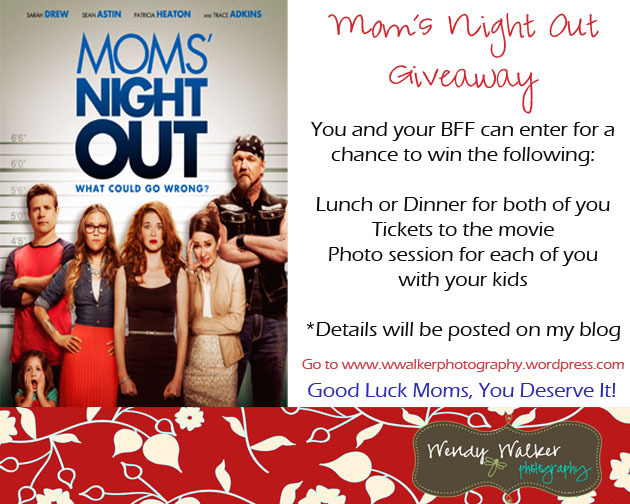 Go to Wendy Walker Photography’s Pinterest board called 2014 Mom’s Night Out Giveaway and repin the contest poster, which is below. Easy, Uh? After you re-pin the poster, take a picture of you and your BFF with your kids. It can be 2 mom sisters, a mom and her daughter (that’s a mom), 2 mom friends, etc. You get the point……The photo has to include both moms and their kids in (1) picture. It can be any kind of photo, a selfie, mobile, silly, etc. Email it to giveaway@wwalkerphotography.com. Please put both moms’ names and contact info. I will then send you a confirmation email stating that your photo has been received. All pictures must be received by May 17th at midnight. If you don’t have the “Pin It” on your browser, you can get it by clicking here. Photos will then be uploaded to the Wendy Walker Photography 2014 Mom’s Night Out Giveaway board on Pinterest. The picture with the most Pinterest repins will be announced as the winner on Monday, May 19th. Spread the word about the contest. Share with friends and family through Facebook, Twitter, Google+ and mobile photography apps. Remember, you’ll need their help to repin your photo on the Pinterest board! Make sure to reference Wendy Walker Photography when you share. On Twitter, give us a shout out @wendywalkerphot and tag WendyWalker Photography in your Facebook share. Good luck to all the MOMS!! You sure deserve this!!!! !